With the world population expected to reach 9 billion by 2050, engineers and scientists are looking for ways to meet the increasing demand for food without also increasing the strain on natural resources, such as water and energy, an initiative known as the food-water-energy nexus. Ramesh Raliya, PhD, a postdoctoral researcher, and Pratim Biswas, PhD, the Lucy&Stanley Lopata Professor and chair of the Department of Energy, Environmental&Chemical Engineering, both at the School of Engineering & Applied Science at Washington University in St. Louis, are addressing this issue by using nanoparticles to boost the nutrient content and growth of tomato plants. Taking a clue from their work with solar cells, the team found that by using zinc oxide and titanium dioxide nanoparticles, the tomato plants better absorbed light and minerals, and the fruit had higher antioxidant content. "When a plant grows, it signals the soil that it needs nutrients," Biswas says. "The nutrient it needs is not in a form that the plant can take right away, so it secretes enzymes, which react with the soil and trigger bacterial microbes to turn the nutrients into a form that the plant can use. We're trying to aid this pathway by adding nanoparticles." Zinc is an essential nutrient for plants, helps other enzymes function properly and is an ingredient in conventional fertilizer. Titanium is not an essential nutrient for plants, Raliya says, but boosts light absorption by increasing chlorophyll content in the leaves and promotes photosynthesis, properties Biswas' lab discovered while creating solar cells. 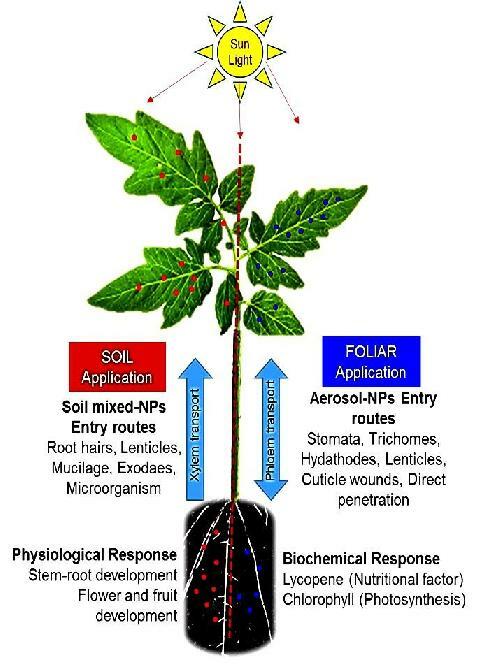 "We found that our aerosol technique resulted in much greater uptake of nutrients by the plant in comparison to application of the nanoparticles to soil," Raliya says. "A plant can only uptake about 20 percent of the nutrients applied through soil, with the remainder either forming stable complexes with soil constituents or being washed away with water, causing runoff. In both of the latter cases, the nutrients are unavailable to plants."